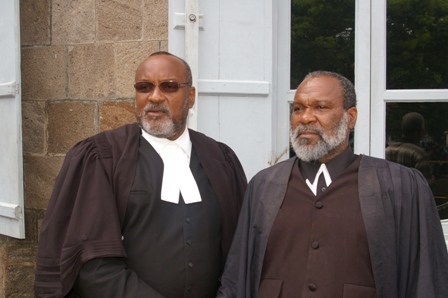 (Charlestown, Nevis–Friday July 8th, 2011) Premier of Nevis, the Hon. Joseph Parry said he is displeased that the Concerned Citizens Movement (CCM) had sought to deliberately delay the July 11 local election on Nevis. He made the statement during a Press Conference on Friday afternoon at the Bath Hotel Conference Room. Leader of the Opposition CCM, the Hon. Vance Amory filed an application in the High Court Tuesday (July 5) seeking an injunction to stop Monday’s poll. Flanked by lawyers for the Supervisor of Elections and the Attorney General, Dr. Henry Browne and Sylvester Anthony, the Premier informed the media that the CCM had no concern for persons who were coming from North America or the UK (United Kingdom) to exercise their franchise. “It was very likely that many of them would not be able to come back home to vote”. The question to the CCM is: “Was the actions of the CCM purposely done to disenfranchise Nevisian voters from voting?”, the Premier asked. He called it an attempt to “hijack” the elections. On handing down his decision Friday morning , Justice Mario Mitchell told a packed courtroom that the attorneys for the respondents had argued that the Court did not have jurisdiction or the power to stop an election that was already in train. He further stated that the attorney for the claimant Dane Hamilton QC, had conceded that point, and withdrawn their application for an injunction. Mr. Amory, in his application to the Court, claimed that his name had been removed from the voters’ list, but failed to provide any evidence to substantiate his claim. Amory’s lawyers later admitted that Amory’s name did appear on the voters’ list for the upcoming election, where he is registered in the St. George constituency. 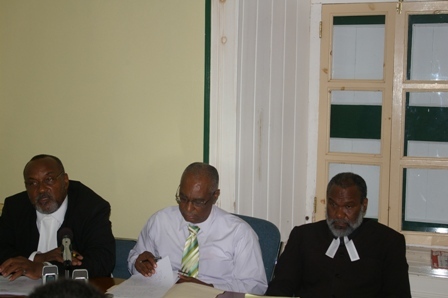 The admission was made after lawyers for the Supervisor of Elections and Nevis Registration Officer Mrs. Bernadette Lawrence submitted and circulated a copy of the voters’ list issued by the Electoral Office. Speaking at the Press Conference, Premier Parry said, “Mr. Amory must have known that he was on the list, and he lied! I believe, it is very unbecoming of a person we call a senior statesman, for him to be developing a reputation like this”. In a separate suit brought by Angis Palmer, Efigenia Palmer-Valdespin, Fernando Palmer, Evelyn Palmer and Cresentia Palmer against the Supervisor of Elections, the Attorney General and Registration Bernadettte Lawrence sought the Court to restore their names to the voters’ list. Their claim stated that their names had appeared on the January 15, 2011 list but did not appear on the list that will be used for the upcoming election. The Court ordered that out of the abundance of caution, that as an Interim measure, that their names be restored to the voters’ list so that they be allowed to vote on Monday (July 11). The other 241 names, which the CCM wanted restored to the list had no such luck. The Judge ruled that it was not within his purview to do so, and in any case, that the CCM had not provided supporting affidavits. “What I want the people of Nevis to know is that the names that were taken off the list have nothing to do with the Nevis Reformation Party (NRP). It is a matter of the Electoral Office and the lawyers for the CCM, the Premier said. He said that the NRP will continue campaigning and leading the way forward by outlining the many projects and programs laid out in the NRP 2011 Manifesto, “Transformed – Better for All”.